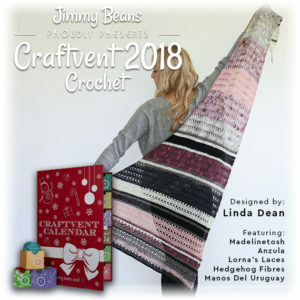 So if you have been fortunate enough to receive a limited edition crochet Jimmy Beans Wool Craftvent for 2018, I thought I would share some tips and insight behind the design. Note: This kit sold out and is no longer available on their website, but it doesn’t hurt to call and see if one may be hiding in the back. (If you were unsuccessful obtaining one, read to the end and I will share some insights to making your own). 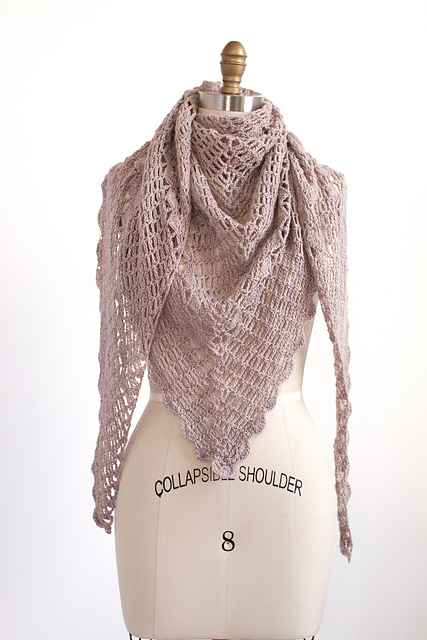 To begin with the shawl starts at a point and increase on one side until it becomes a large triangle. The first couple of rows might be the most challenging, especially since it is small and there is not much to hang on to. The first row, essentially becomes a “V”, ensuring that all odd number rows will be worked in a “V st” pattern. The even number rows are simply double crochet stitches worked into all the stitches and spaces across. To help you keep an accurate row count, the number of “V”’s will increase by 1 every time you work this row, while the double crochet row will always increase by 3 stitches. So if you had 3 “V” stitches in row 5, you will have 6 “V” stitches in Row 7, while if you had 10 double crochets in Row 6, then you will have 13 double crochet stitches in Row 8. Also the increase are worked on the same side as the color changes, keeping all the pattern differences on one side of the work. While this “V” stitch/double crochet row repeat makes up a vast portion of the design, the smaller rows of back loop single crochet stitches are always worked in pairs, and there are no increase worked in these rows. This little stitch pattern adds a great contrast in the fabric, not only visually but texturally too. You can order a skein of each from Jimmy Beans Wool and create your own color blocking effect. I will admit, I was so excited about this project that I purchased a kit myself, and am reworking the shawl again day by day in the calendar! You can follow along with my progress at my Facebook Page or Instagram. Hope you enjoy this process as much as I am! There are a couple of stitches that always seem to make their way into my work. I find that I create multiple projects using them, and still I never tire of working them. 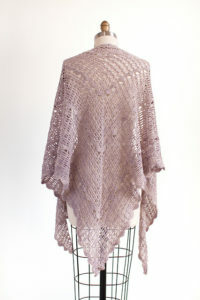 My latest design from Manos del Uruguay and Fairmount Fibers, Pechin, falls into this category. This shawl is worked from the center of the neck outward, utilizing a simple chain and single crochet combination. I find that this stitch allows that yarn to really be the feature. 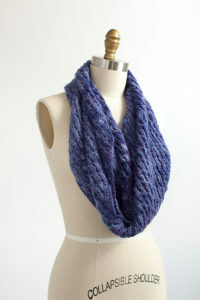 It creates a light, airy fabric that embodies the yarn to go as far as it can. By this I mean that you can go a long way with just one skein. 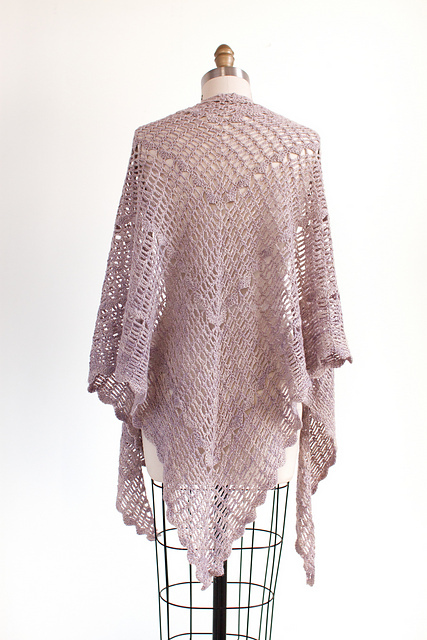 As an example, Pechin is only a 2 skein shawl (using Manos del Uruguay Milo), and a really good sized shawl at that. For Pechin, I broke up the chain stitch pattern with bands of shells. This creates a visual break as well as a bit of dimension. The bands gradually space further apart in this design to help keep the flow balanced, and I feel it helps give a really classic look. 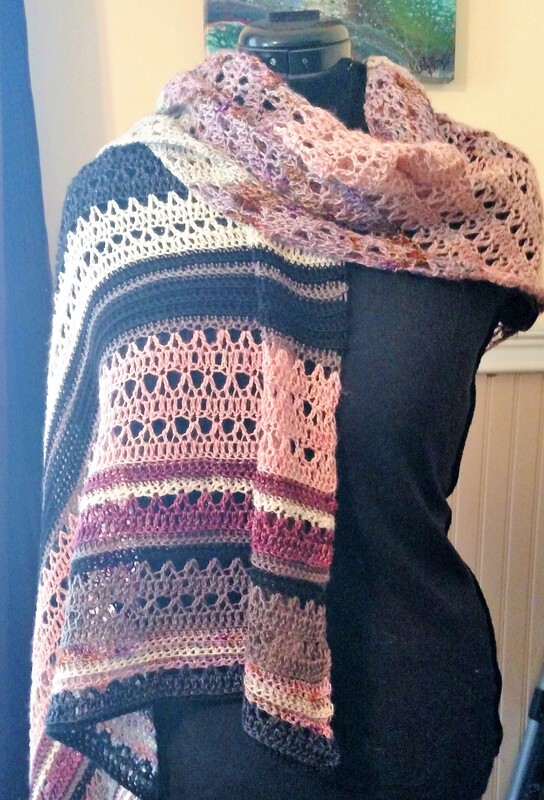 I have to admit, I could work this shawl over and over again. The stitch pattern has a nice rhythm, and just enough details, at just the right time, to keep it from getting boring. I also feel that it really has a beautiful balance between the design and the yarn, they feel at harmony with one another as neither over powers the other. 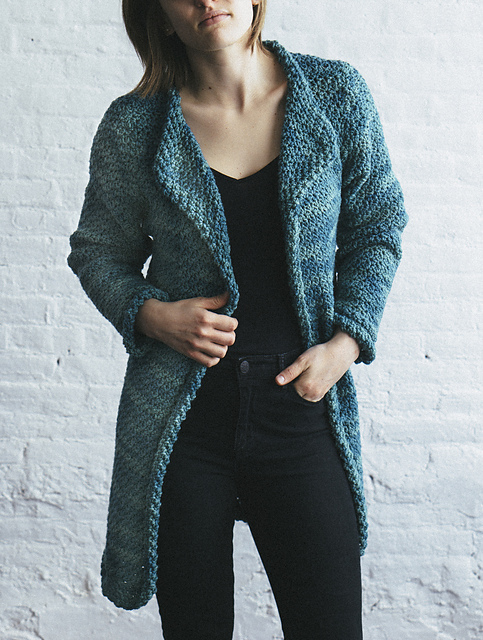 Okay, that might seem a bit wordy or dramatic, but what I mean is that it is a pattern/design in which you can appreciate both the yarn and the design at the same time. 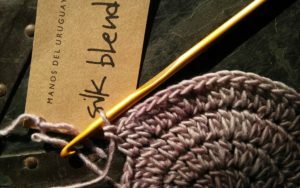 I have spoken in the past about how you select a yarn or pattern to bet let one or the other be a highlight, like not using a variegated yarn in a design that is heavily textured, as the yarn will win over the design (read more here). Pechin however, has a balance that allows the yarn to shine as well as the design, and this is true even if the yarn is variegated. Perfect for the Chill- Shurs! 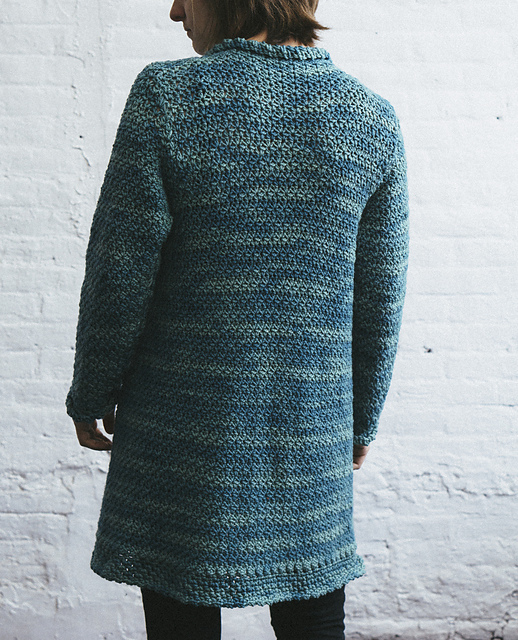 As winter is gripping part of North America and the arctic chill is setting in Manos del Uruguay released my latest pattern, which is perfect to keep warm! 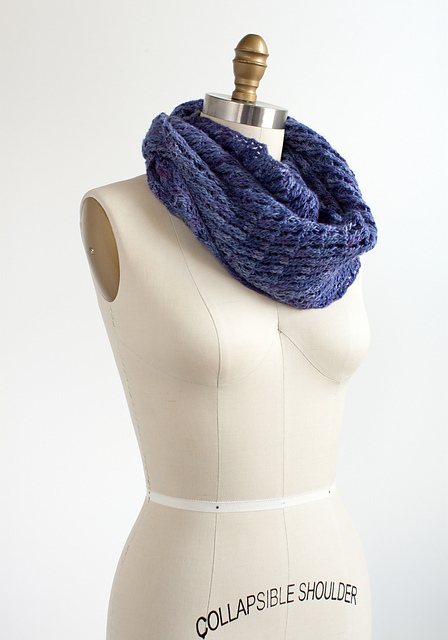 Shurs is a cowl that is just the right size, long enough to be wrapped twice for extra warmth and coverage, yet still short enough that wearing it unwrapped has a perfect amount of drape for a classic look. It is worked in what I refer to as a “cross-hatch” pattern. So, cross-hatch is actually an artist term the is comprised of short strokes made usually by pencil or charcoal that then has short strokes crossing in the opposite direction to create the shading and depth of the drawing. Almost like little “x”s that create an image. I have worked this cowl similarly, with each row crossing the opposite direction of the last. It allows for an interesting visual effect, as you can catch glimpses of the stitches behind each other, but it also adds in a nice amount of stretch. In addition to the “crossed” appearance, the stitches begin to stack up and give a very diagonal look, without having any increasing or decreasing stitches being worked. Instead this is a simple 2 row repeat, so it is a design that you can work rather quickly and easily, even for a crocheter that may not be completely confident in their work. 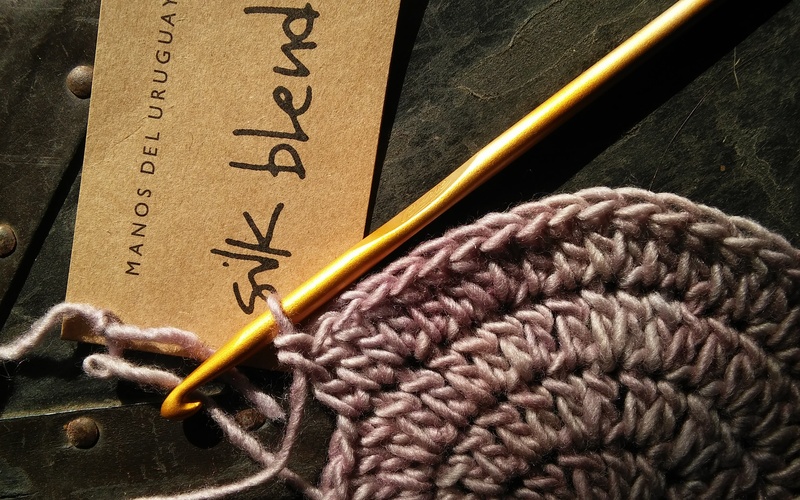 It is worked in Manos del Uruguay Clara, a yarn that is 100% superwash merino (meaning that it is a wool that is treated so that it does not felt, or shrink, but has all the great properties of wool like warmth and durability). It is a hand dyed sport weight yarn, that has a nice amount of spring to it while still having a nice stable yarn. So, consider a quick project to keep warm this cold season, Shurs I feel is a good choice for this project. Photos courtesy Fairmount Fibers, Ltd.